Remember when we commence the Erev Shabbat, when entire family gather the table meal, we must declare and acknowledge Elohim our Creator of Universe. We would like to encourage those who had learn about the significant of Shabbat to have your own shabbat with your own family members or invite your relatives and friend to learn the truth of Shabbat, the Torah and goodnews of Yeshua. I did a brief the summary guidelines on what are basic requirement to have your own sweet Shabbat fellowship with the Almighy together with your family. As you grow in your understanding the Torah, you can learn to give your best items that you have for the Shabbat. Two loaves of Challah Bread twisted (Kosher), either buy from Jewish synagogue - if not available use plain white bread, leaven Bread ensure to be at least halal; if Shabbat on Passover use Unleaven Bread - Matzah, If Shabbat falls on Roshanah / Sukkot (Feast of Tabernacle) use Crown Challah bread. Ensure to buy bread that are made of clean elements. Messianic Shabbat Siddur follow the order of service from the welcoming the Shabbat on Pg 7, woman lighting the candles proceed to pg 8-26, Then recited the Shabbat Kiddush on page 24-25, then the Blessing for the Challah Pg 26 bottom page. After which the family will proceed the dinner and fellowship. Kosher Salt alternative organic sea salt - salt tray to contain the salt. 2 candle holders - optional, if unable to light candle then recite the Alternative blessing of the Shabbat at the bottom paragraph of pg 7. Matches ideal for Shabbat or candle lighter. Woman head covering or normal scarf or mantle long "tallit-like" scarf - Married woman require head covering. Challah Bread Cover - alternative nice flowery cover. 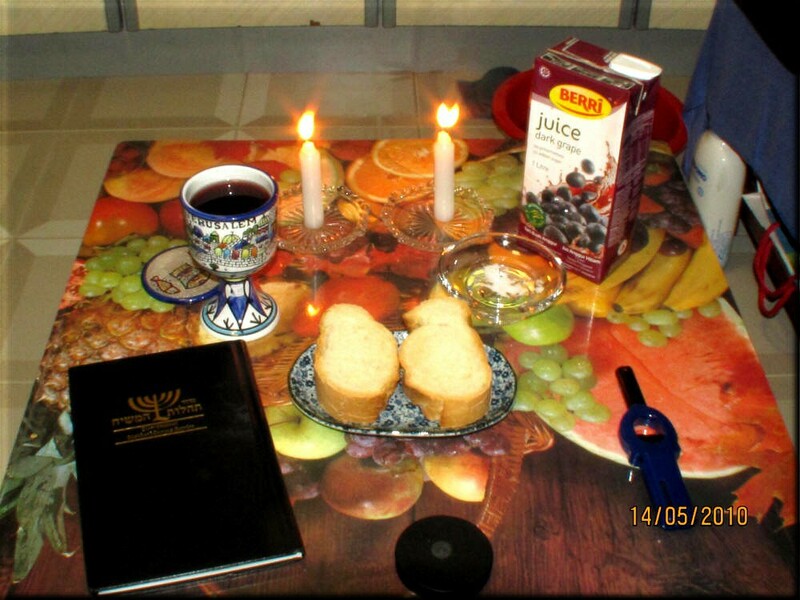 Lighting Shabbat candles (Hebrew: נרות שבת‎) is a rabbinically mandated law in Judaism. Two candles or more are lit on Friday evening, 18 minutes before sundown, to welcome the Sabbath. Candle lighting is traditionally done by the woman of the household, though in the absence of a woman, it is done by a man. After lighting the candles, the woman waves her hands over them, covers her eyes, and recites a blessing. Most rabbinic authorities hold that the requirement to light the Shabbat candles is of rabbinic origin. In some households, more than two candles are lit. Some families light an additional candle for each child. Lighting the candles is known as licht bentshen in Yiddish. It is customary for a woman to light the candles, but if there is no woman in the household, a man may light them. Baruch atah Adonai Eloheinu Melekh Ha Olam, asher kidshanu b'mitvotave v'tzi vanu l'hadik ner shel Shabbat. 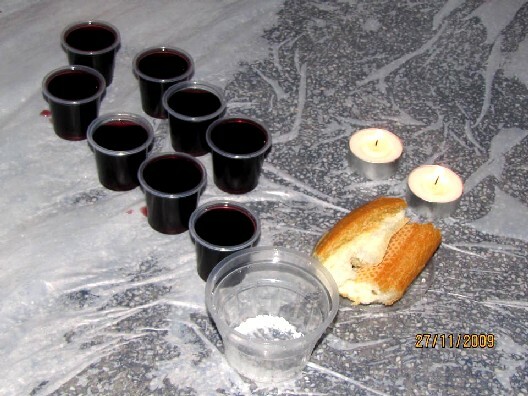 Blessed are You, Adonai our God King of the Universe who sanctified us with His commandments and commanded us to kindle the lights of the Shabbat. The practice of lighting of Shabbat Candles is merely Jewish Tradition, we are not commanded in the written Torah. We place emphasis on the Biblical command to sanctify the Shabbat with this Blessing. Blessed are You Adonai our Elohim, King of the Universe Who sanctified us with His commandments and commanded us to sanctifiy the Shabbat Days. 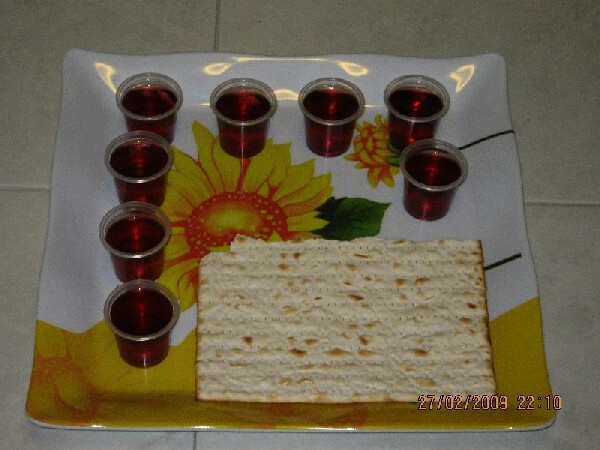 Barukh attah HASHEM (ADONAI) Eloheinu melekh ha-olam, asher kiddeshanu bemitzvotav vetzivanu al netilat yadayim. who has sanctified us with Your commandments, and commanded us about washing the hands. A Bowl and a two handled pitcher is traditionally used for the hand washing ceremony. 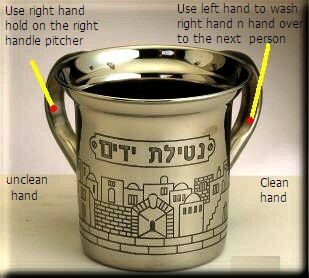 The two handled pitcher derives from the concern over ritual purity during the time of the Second Temple. Since impurities were transmitted through contact, the two handled pitcher was developed as means of ritually cleaning the hands. Just as when a person is clean must not return or walk or do the ways of uncleanness or the old way or old nature that will redefile himself again. 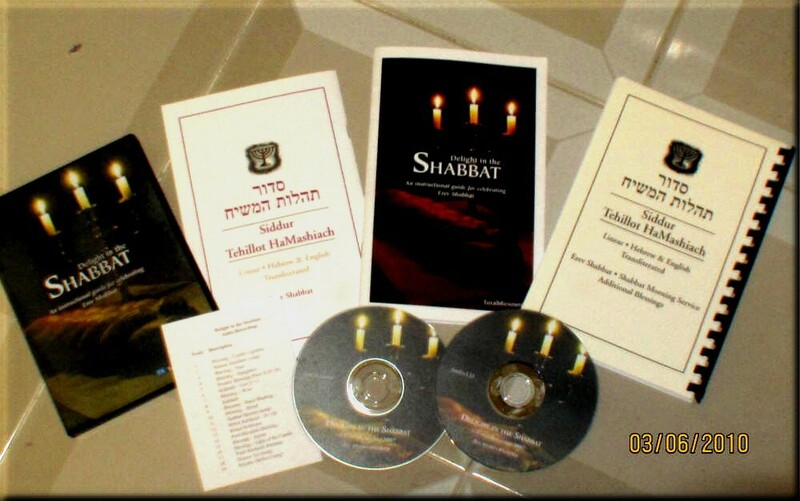 It is ideal and worthwhile to get this complete set as seen above display items:- Two booklets of Siddur for couples, Shabbat an instructional guide for celebrating Erev Shabbat, two CD consist DVD video n Audio CD. 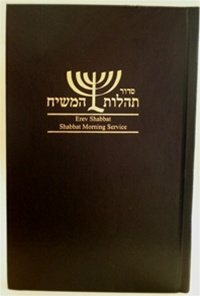 The Siddur is the same as the hard cover Siddur. If you want to begin the Shabbat with a traditional erev Shabbat meal and just don't know how, this instructional package is for you! The audio recordings on the CD are in normal CD format, playable on any CD player. The 10 minute video demonstrates the traditional manner for lighting the erev Shabbat candles as well as the traditional ceremony for the conclusion of the Shabbat, called Havdalah. 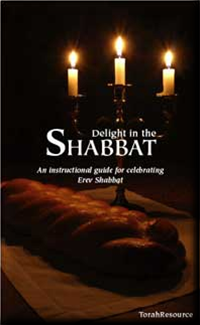 Delight in the Shabbat: An Instructional Guide for Celebrating Erev Shabbat (includes 1 Shabbat Siddur, 1 Erev Shabbat Siddur, 1 Delight in the Shabbat booklet, an audio CD with all the blessings for erev Shabbat and Havdalah (mp3 format), as well as a DVD containing a 10 minute video showing candle lighting and havdalah ceremony. Written and compiled by the staff of TorahResource. Unleaven Bread will be use during Shabbat for Passover, or New Moon and the period of the Seven days of unleaven bread only. 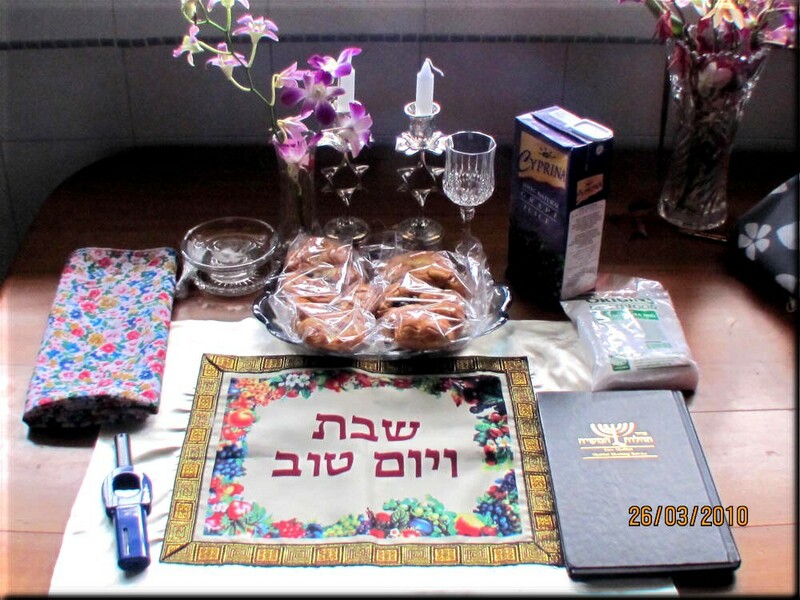 This is simple Erev Shabbat for Kiddush and blessing of the Challah, a low table "Japanese dine table", sitting on the floor.